Ask The Ripped Dude: What's An Effective Bodyweight Workout? I want to implement bodyweight exercises into my training program. Do you have a good bodyweight workout? 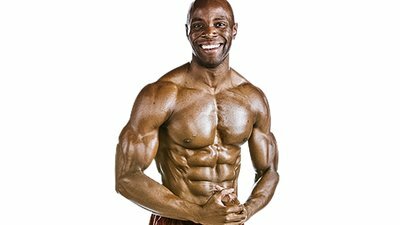 Question: I want to implement bodyweight exercises into my training program. Do you have a good bodyweight workout? Most people think that in order to build muscle, they need to copy Arnold in Pumping Iron. I have no argument with Arnold-weight training makes you stronger, fitter, and leaner. However, it's not the only way to train. Sometimes, adding bodyweight exercises to your program can be an effective way to build muscle and lose fat. It's also a great way to break from your normal weight training routine. I've been bodyweight training for many years to give my joints time to de-stress and my mind a different focus. Several times each year, I stop using weights for two weeks and just use my body as a replacement for heavy weights. In order to make my bodyweight workouts difficult, I rest only 30-45 seconds between sets. I've found these workouts to be just as taxing as the ones I do with barbells or dumbbells. I sweat, burn lots of calories, and get a good pump. The key: I make my bodyweight workouts difficult. You can't expect to get anywhere if you do five push-ups and call it good. You can't expect to get anywhere if you do five push-ups and call it good. Implement this workout three times per week. Rest only 30-45 seconds between sets. Convenience: Bodyweight exercises can be done anywhere. They're especially great for vacation or when you don't feel like driving to the gym. Affordability: You don't need any equipment for a tough bodyweight workout. You'll get a great workout for free. The only cost is effort. Great for rehabilitation: If you have injuries, bodyweight movements can help you build strength without risking fuerther damage. Improves Athleticism: Your flexibility, balance, and endurance can all imporove with bodyweight training.